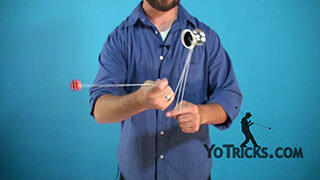 Learn how to do the Pendulum Wrap. 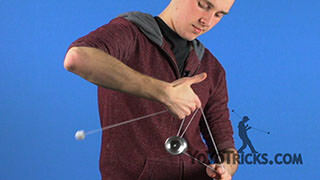 To perform this trick, you are going to need to know how to do the tricks Basic Stall, and 360, both of which you can learn in our 5A Fundamentals Series, so if you do not know those tricks, go back and learn them. 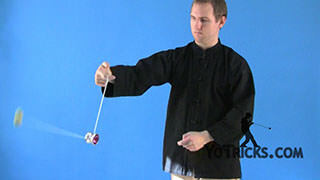 To do Pendulum Wrap, first you are going to want to start in a trapeze. 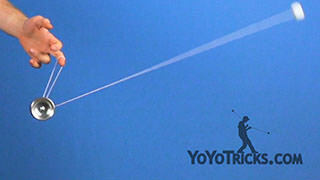 Then you want to do a Basic Stall. 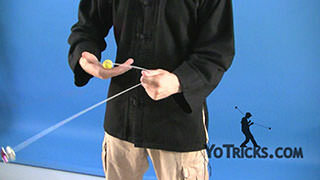 Right after the counterweight stalls, you are going to want to take your throwhand pointer finger and hook it in front of the counterweight string. 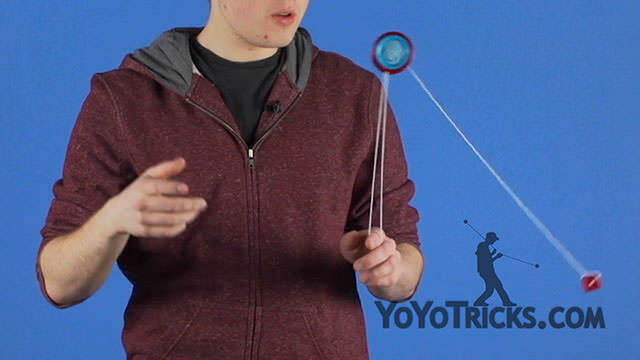 So as you can see, the counterweight string is draped over my pointer finger, and my pointer finger is pointing straight in towards me. 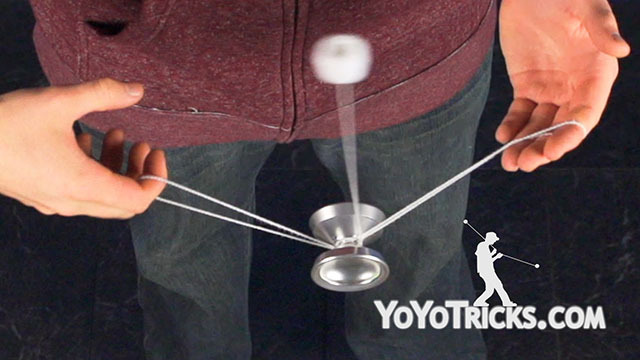 After the counterweight stalls, it is going to start swinging in the opposite direction, and when that happens you want to swing the string into the gap of the yoyo to the front of the two strings on your opposite hand. 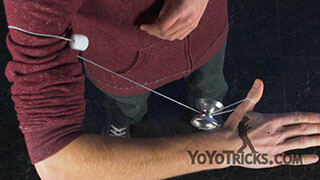 You want to catch the counterweight with your palm facing up, just like how we teach in our 360 video. 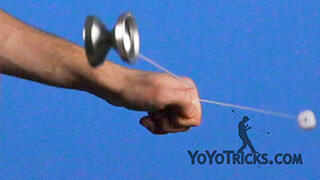 Then drop the string on your throwhand pointer finger, and the yoyo will land into a trapeze. That is the first half of the trick. 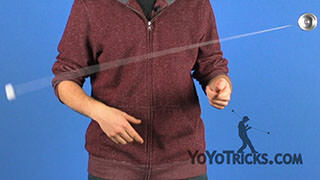 Continuing from a trapeze, you are going to want to pinch the trapeze string right above the yoyo with your pointer finger and your thumb on your opposite hand. 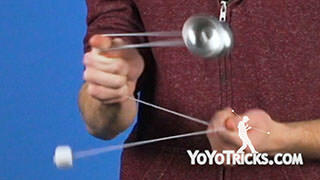 Then you are going to want to loosen your grip on the counterweight so it slides down. 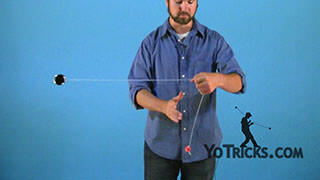 You are going to want the string set up just like how it was in the first half of the trick, with your throwhand pointer finger being hooked in front of the string. We are going to swing the counterweight into the gap of the yoyo to the front of the two strings on our opposite hand, and rather than catching it, we are also going to have it go around to the front of our two strings on our throwhand. 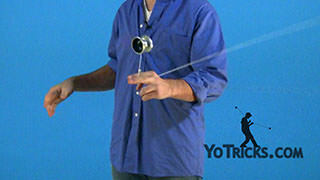 Then we are going to continue the momentum of the counterweight around the yoyo around a second time. 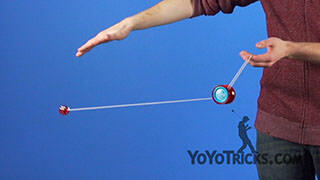 You are going to catch the counterweight just like how we did in the first half. 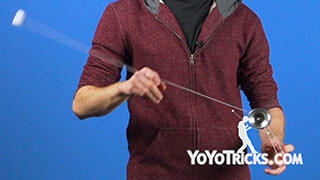 Drop the string off of your throwhand pointer finger. Rather than ending up in a trapeze, now we are in an undermount. 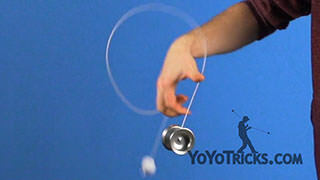 So all your have to do it just perform a bind. 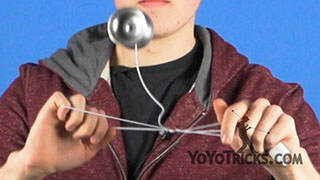 When working on this trick, you might have some difficulty so we have got some tips for you, just in case. 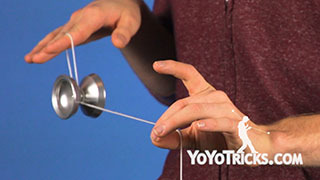 So the first thing that could go wrong when you are doing this trick is that something like this happens, where the string comes off the yoyo. 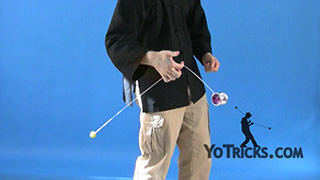 If that is happening, the most likely cause of your issue is that you are dropping one of your hands too low. 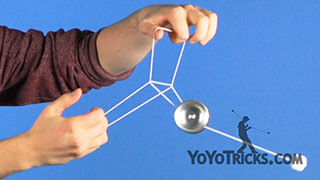 So when the counterweight is swinging around the yoyo, just make sure that both of your hands are on the same level. That should keep everything where it needs to be. 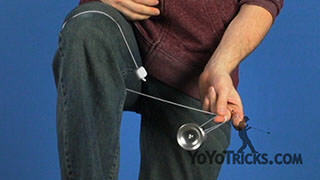 If the counterweight is not quite making it all the way around the yoyo twice, something that can help is raising your throwhand up higher, just so that the counterweight has more time to speed up to give it enough momentum to go around the yoyo. 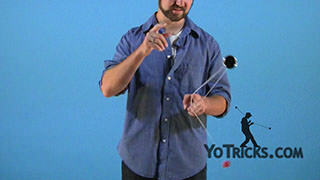 And the third thing that can happen is that the counterweight might tap one of your hands as it is coming around. 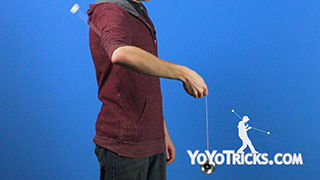 So to avoid that, what you need to do is just to move your throwhand or which ever hand is getting hit in just a little bit, so that the counterweight can make it all the way around without touching either of your hands. 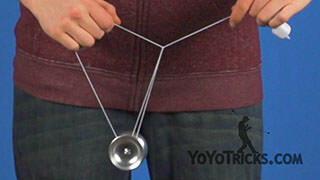 And that is Pendulum Wrap.